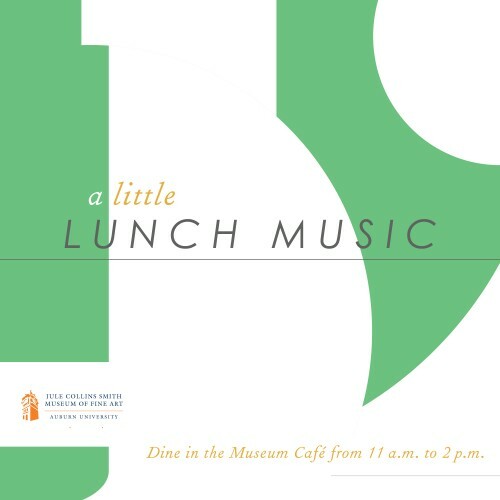 On Thursday, December 10, A Little Lunch Music will present the Auburn Music Club Singers for a free concert in the auditorium. The group will perform a program of Christmas and other music spanning centuries. Aside from accompanying the Singers, pianist Elizabeth Rutland will play a piano four-hand piece with Mary Slaton, collaborate with flutist Janet Sanders, and perform solo. The performance is unsponsored. Contact Kate Cole at katecole@auburn.edu or 844-1675 to make a gift to support the efforts of these musicians. The café menu is available online. The idea of a club for music in Auburn occurred to a group of women who gathered to play recorders. The first organizational meeting was in the home of Helga Wilmoth in 1979. Those who attended that first meeting included Dorothy Bennett, Patsy Johnson, Julia Norton, Marilyn Schaeffer, Carol Bramlett, Carol Schafer and others. At first, meetings were held in members’ homes or else in a church or a recital hall. Programs featured members of the club or the Auburn University music faculty. The stated objectives of the Auburn Music Club were “to encourage interest and participation in all areas of music and to promote music in the community, homes, and local schools.” At one of the first meetings, Carol Bramlett organized a group of singers to meet and perform for the club or for schools and nursing homes. At age 50, while working as an administrative secretary for the City of Auburn, Phyllis Gauker earned a Master’s degree in choral conducting from Auburn University. Retiring in 2002, she began directing the Auburn Music Club Singers, and promised them that every year she would expose them to serious choral repertoire. This often means she has to transcribe music originally for mixed choir to accomodate the all-women group. Growing up in Arlington, Virginia, Phyllis was surrounded by cultural activities in the nation’s capital. She graduated from William & Mary in 1962 as a voice major and taught high school choral music for 5 years at Highland Springs High School in Richmond, Virginia, and at Charlotte Amalie High School and Wayne Aspinal Junior High School in St. Thomas, US Virgin Islands, where she lived for seven years. She and her husband lived in Spain for three years where she gave birth to her son. Her daughter was born in Guatemala, where they were missionaries for a Maryknoll priest after the 1976 earthquake. There, her husband and the priest were killed in a plane crash. 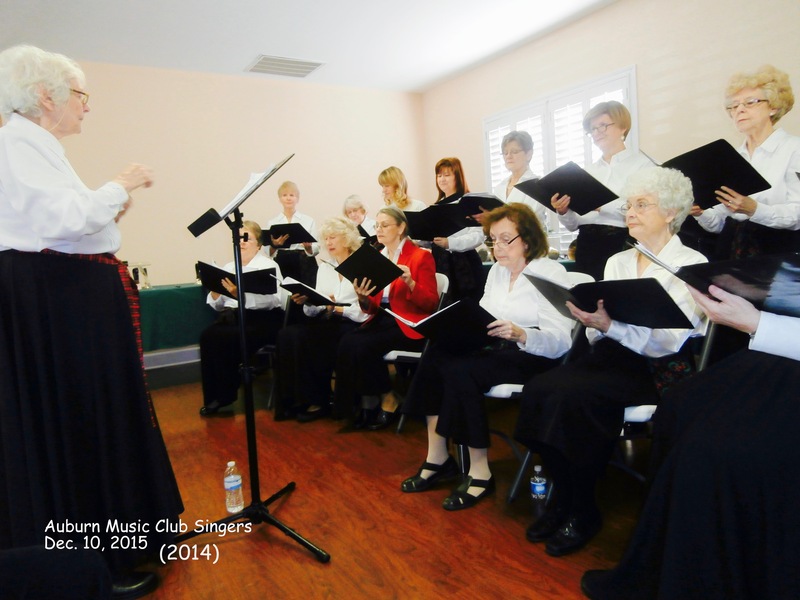 Phyllis sang with the Auburn Music Club Singers when it formed soon after the Club was founded in 1979. She very briefly directed it in 1983 before taking the job with the city. Phyllis has managed the Thrift Shop at St. Michael’s Catholic Church in Auburn, and directed its choir. Pianist Elizabeth Rutland received her Bachelor of Music degree from Auburn University. She is active in the Alabama Music Teachers’ Association and maintains a private studio in her home. She recently retired as organist at Grace Methodist Church. She has been accompanist for the Music Club Singers for several years and has composed a number of musical works. Flutist Janet H. Sanders, a native of Delaware, Ohio, received her Bachelor of Music and Bachelor of Arts (music education) degrees from Ohio Wesleyan University. She holds the Certificate with Honors from the Kodaly Musical Training Institute and earned the Masters of Music degree from New England Conservatory of Music. Ms. Sanders has taught music in Ohio, Massachusetts, Guam, Georgia, and Alabama. The widow of Librarian Emeritus Thomas R. Sanders, Janet is the mother of three grown children and an active member of the Baha’i Faith. Besides music, she loves reading, swimming, walking, playing with her dogs, and Auburn football and basketball. Over the years, Mary Slaton has entertained with her extensive knowledge of popular music, and is known throughout the southeast as one of the region’s premier piano soloists. She is leader of the Mary Slaton Trio and coordinates the East Alabama Community Band in which she plays French horn. Among Memphis venues, Mary has performed at the Hilton and the Hyatt Regency. In Atlanta, she has played the Omni Hotel, the Hilton, the Atlanta Country Club and others. At home in the Auburn-Opelika area, she has been featured at the Terra Cotta, the Saugahatchee Country Club and the Marriott. Mary holds piano degrees from Memphis State University and from the University of Montevallo. She teaches privately and at Southern Union Community College.